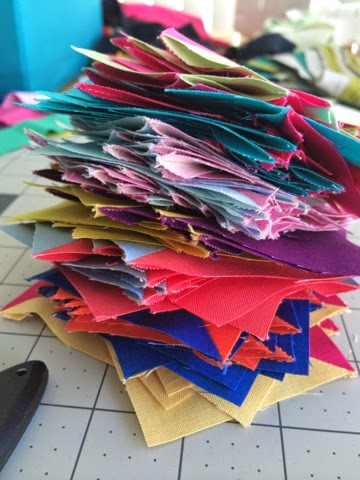 Triangle on a roll - the closest that I get to paper piecing! Mock up color placement on the design board was a fun step. The bright colors were chosen to represent the Begonia Festival and the one block mini reflects the small 2 square mile size of town and the railroad that runs through it. My newish ruler came in so handy trimming up. Although not a perfectionist (sort of an anti-perfectionist truth be told) I didn't want to cut too many tips. I rarely (read: almost never) mark anything. The color change is subtle but there are two different threads used inside and out of the chalk line. This is as close to matchstick as I've come with a wider spacing for the pink. 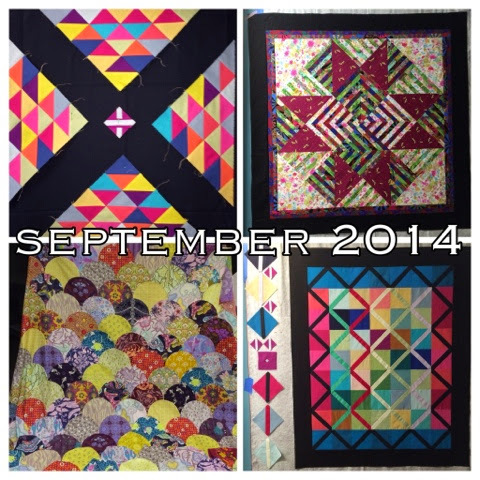 Linking up to Blogger's Quilt Festival - Modern category and to ALYOF October Finish Party. 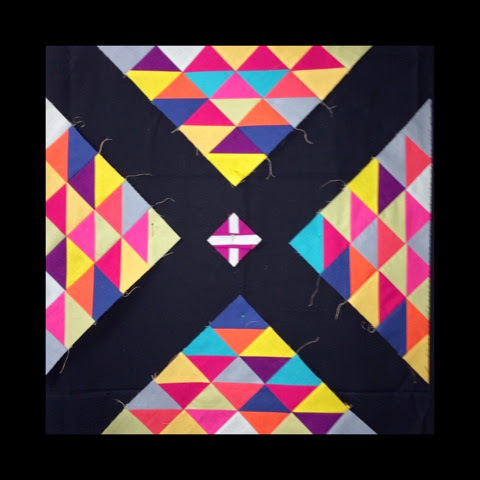 Inspired by the Lattice quilt ca. 1930 Haven Kansas from the book Amish Abstractions: Quilts from the Collection of Faith and Stephen Brown. 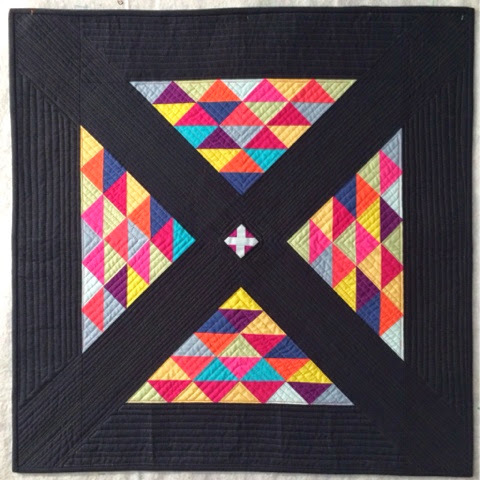 I made this quilt as an entry for a juried exhibit that our local MQG challenge is participating in next month called Amish: The Modern Muse. Nine days start to finish was a whirlwind. 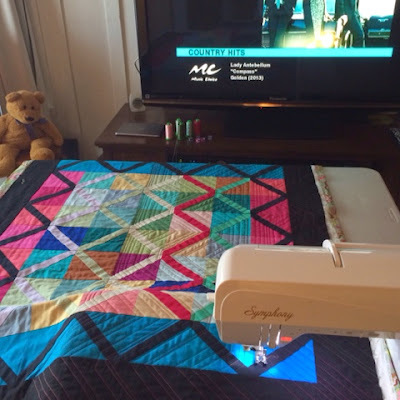 I love scrappy and graphic but have very little experience working in solids or straight line quilting, so it was indeed challenging. 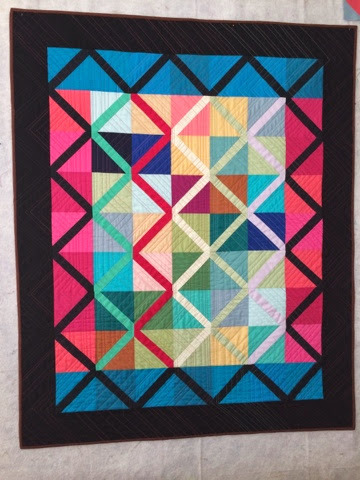 When I was quilting this we had record breaking heatwave and it was suffocatingly hot in my sewing room so I migrated out into the living room. Because I waited to the last minute to start and was down to the wire with the deadline, there are areas where the intersections don't quite meet up. Although I wholeheartedly embrace the philosophy of Perfectly Imperfect, if I could turn back the clock I'd redo the joints that are distractingly misaligned. I'll share a close up of where they did match and spare you the eyesore. 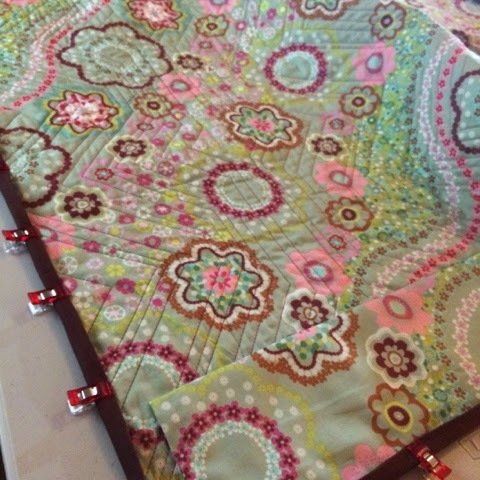 Changing up the thread color and path of the stitch line at whim was tricky but worth it. 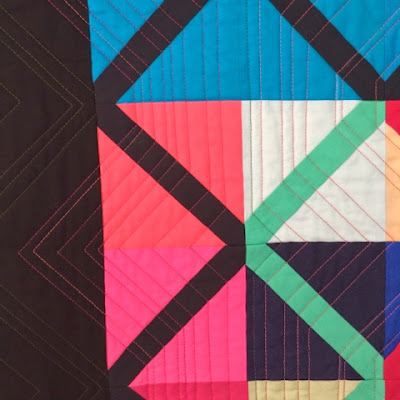 It was a fine line between paying tribute to the original quilt and putting my own spin on it so that it wasn't simply a replica but rather an interpretation of. 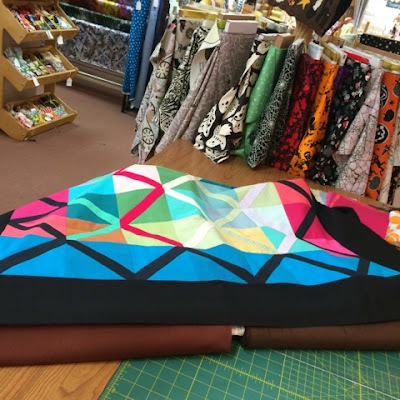 A quick trip to the LQS to find the perfect brown binding (thank you Hart's Fabric for your impressive Kona selection)- the one on the left was closest to the color used on the inspiration quilt. I was terrified of the high contrast thread breaking across the ribbons but that ends up being one of my favorite elements. 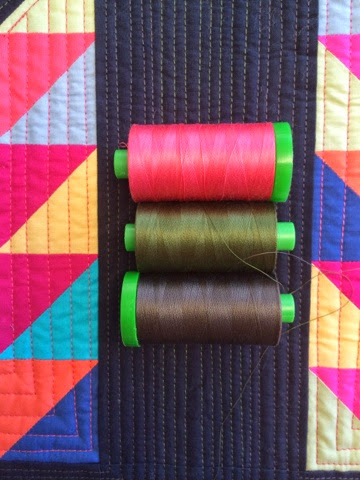 Also, the change up of thread color was super fun. 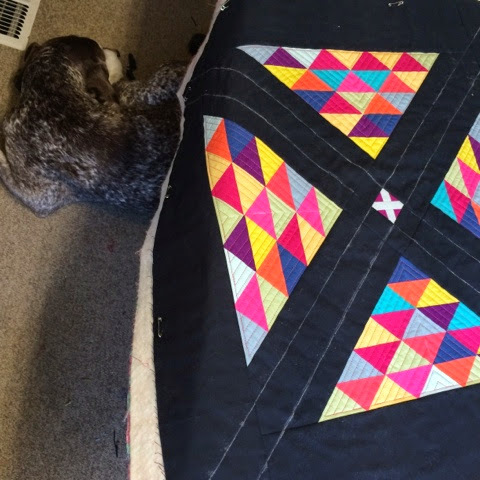 The back shows the quilting pretty well and the binding color I love with both sides. This is the closest I've come to matchstick and it was kind of fun - on a mini! I had considered hand stitching with Aurifil 12 wool the center "belly button" and decided to leave it as is. 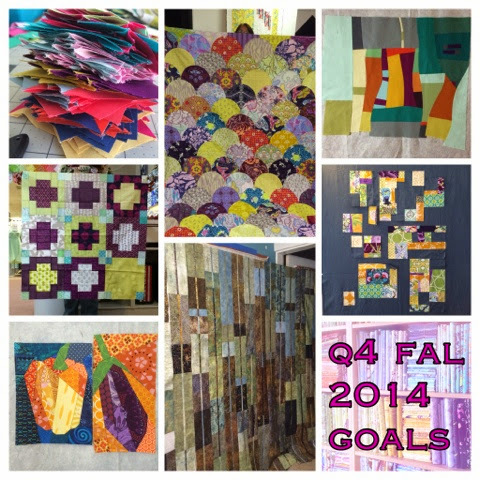 Linking up to FAL Q4 Goal setting party at The Little Thistle and WIP Wednesday with Freshly Pieced and Let's Bee Social and Finish It Up Friday at Crazy Mom Quilts. 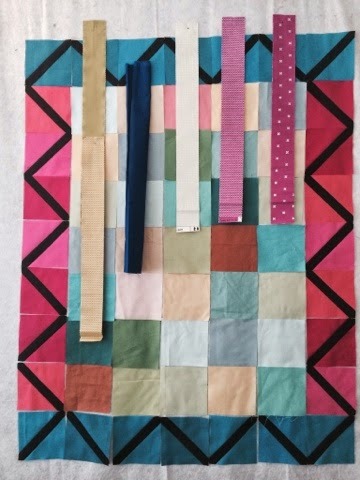 I've never made a quilt with only solids before and it's about time. 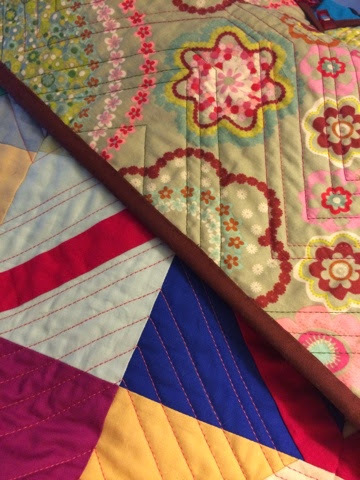 There have been blocks for bees and swap placemats, but not a quilt. Here's my October aLYOF goal, a mini. It had better get done this month because I hit submit on the entry form to hopefully have it at the Community Exhibition Amish: A Modern Muse. 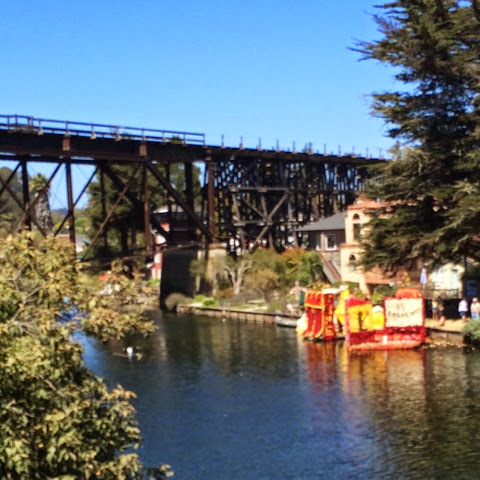 Titled "Capitola Crossing" instead of my catch-all Amish-ish I'm super excited about paying tribute to the little town I'm lucky to live in. 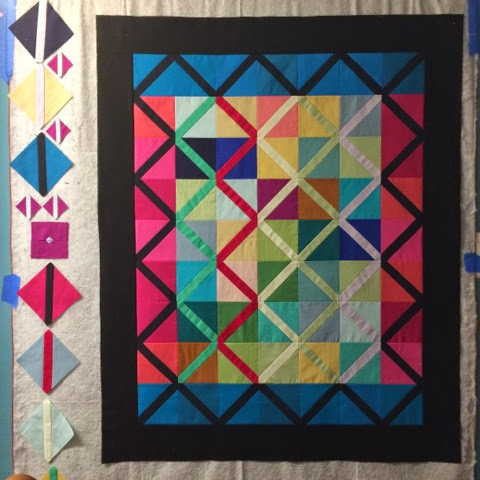 The original inspiration, a quilt from 1930 has a four block layout which I set out to duplicate and went into major mass production of HST to get the parts made. But in the end, the single RR was more fitting to represent the tiny 2 mile radius and the trestle that runs through. The upside is that I'm all set to make something amazing for my IGminiswap partner with the extras and I've got my heart set on a new Travel Handmade to take to Houston later this month - or at least to QuiltCon in February. 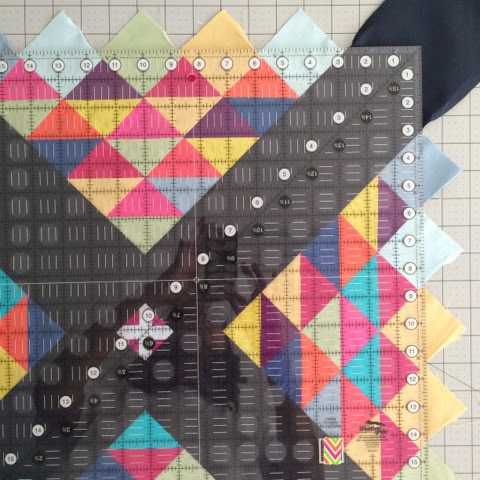 I also narrowed the with of the crosses for a more delicate girly look than the original Amish inspiration quilt. My extra parts seen to the left are much fewer. 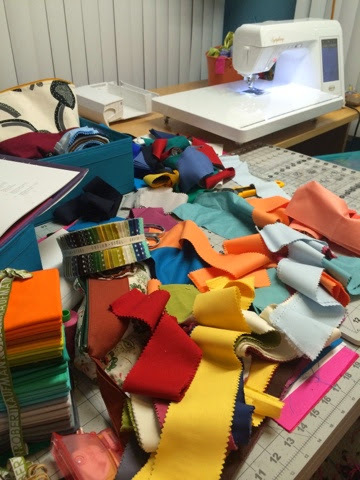 Linking up to Fresh Sewing Day at Lily's Quilts after a much too long of a break (April, yikes). I may try and recreate the missing mosaics for my flickr album to fill the gap. Don't you love how the King Clam looks the same size as my new mini? 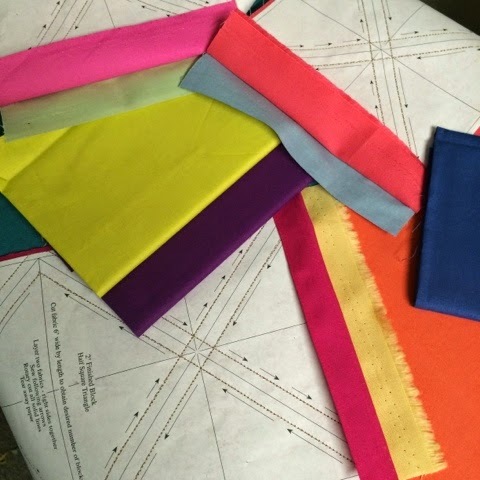 Here's the proof that I've been working with solids. 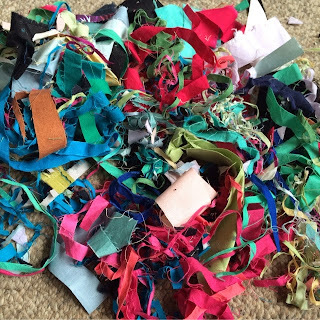 I toss all my bits to the floor as I'm working and "combed" them up before vacuuming resulting in this heap. Pretty sure my Dyson was not designed for this kind of mess. 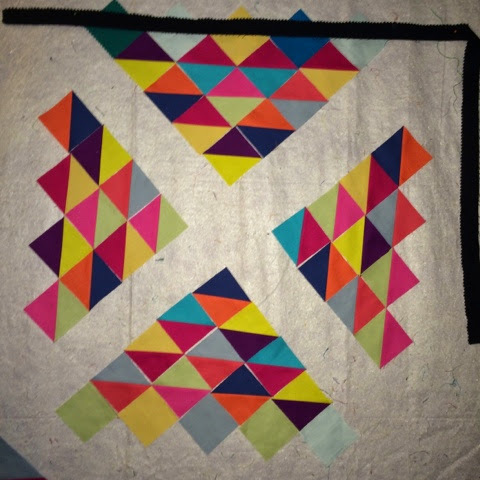 Linking up to WIP Wednesday at Freshly Pieced - check out the Round Up beauty she's been creating, gasp!